Expert sales & service since 1990. 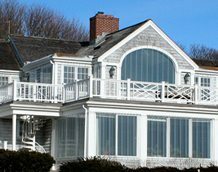 Installations throughout MA - NH - ME - RI - CT - NY - NJ and the Caribbean. The best storm shutter solution to protect your home and family. The clear storm shutter solution that ensures you’re safe inside and still able to see outside. Affordable, code-compliant, easy-to-deploy storm protection. 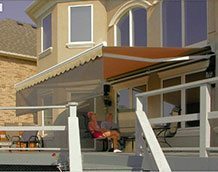 Our luxury louvered pergola covers pivot to your needs for sun and shade or shelter from the rain. 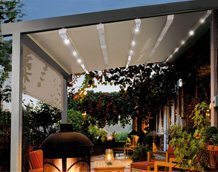 Retractable structural fabric roof designs let you experience more outdoor moments with maximum ambiance. A weather proof interpretation of classic plantation shutters are perfect for your outdoor kitchen and entertaining spaces. 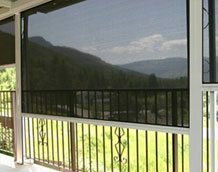 When the wind comes up so do our retractable glass railings, giving you more control of your outdoor living experience. Keep your view, let the air in and keep the bugs out. Make your deck Sun-Safe this season. Entertain in style and comfort. 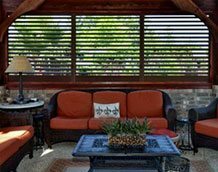 Explore our stylish range of retractable screens and window treatments. Design Your Living Space with Our Interior Shades and Window Treatments. Curb appeal with authentic detail. Our hinged shutters dress up any home. 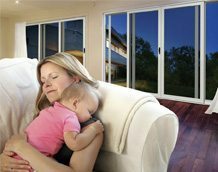 Screen doors & windows made with the world’s toughest steel mesh. Hurricane rated options. 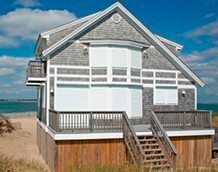 Hurricane fabric is a lightweight and easy-to-deploy alternative to steel or aluminum hurricane panels. Whether it is PVC coated woven fabric panels or our other solutions hurricane fabric is an excellent barrier against natural disasters at a more affordable price compared to other hurricane barriers. Wayne-Dalton Fabric-Shield™ Storm Panels are a highly-effective alternative to steel or aluminum hurricane panels. These PVC coated woven fabric panels are tested to block wind, rain and storm-driven projectiles. Wayne-Dalton Fabric-Shield™ Storm Products have been evaluated for wind load, impact and cyclic testing. Using a variety of mounting techniques, Grommet Screens can be used in tandem with the Strap & Buckle design to provide a hybrid application capable of providing hurricane protection for difficult openings that other shutter types are unable to match. Wall and floor-mount tracks are available in assortment of shapes and sizes, all with corrosion-resistant materials and finishes. 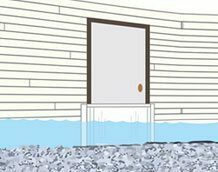 An optional, code-approved emergency egress panel can provide the ability to protect you inside your home knowing you can get out if you have to. This system incorporates the end retention technology of the Rolling Screen, using a lower profile track, with a simple deployment method that is an outstanding application for windows. A new twist on hurricane fabrics. There is no need to board up your home or office leaving you in the dark for days. Easy Screen is an innovative hurricane protection product combining strength and flexibility of the strap and buckle system with our decorative low-profile slide track extrusion, making for easy deployment. Simply slide the light-weight screen into the track along the top and fasten the straps and buckles along either sides, the bottom or both. It’s that easy. 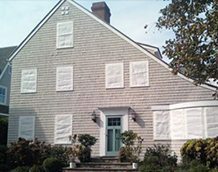 There are no tools required and no fasteners to lose on this Hurricane Fabric System. This system incorporates a flexible attachment design using straps and buckles to fasten the hurricane screen to the structure. The straps are then looped through permanently attached or removable eyehooks or wrapped around columns and securely connected to the buckles. The straps and buckles are sewn into the hemmed fabric and cross-stitched to ensure a solid connection. Design professionals and property owners call us each day to discuss their projects. First, we like to listen and learn your objectives. Our experienced Product Specialist will ask you questions and will share product information to determine if our solutions and services are a good fit. We may ask you to share images of your “as-built” or proposed project area. When you are ready, we will schedule a consultation at your home or office. If you are in one of our full service areas, there is no fee charged. Otherwise, we will assist you in product specification and installation design remotely. We will produce a detailed proposal and review this with you so you know exactly the scope of the work proposed and the contract price. We work as a team so our collective years of expertise can be put to work for you, every time you need us. Just want to say thank you for a job well done, and for a great experience working with your company. Happy Holidays! Job (is) completed, looks beautiful, and most of all Dean & Jason were just wonderful! 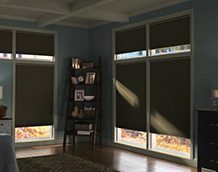 Many thanks for assisting me on the phone recently who I called about our Super-Mini HQ-Safe Roller Shades, your help is greatly appreciated! My thanks too for the fine work done during the subsequent and prompt service call by your two service technicians; they were very nice and the repairs were done expertly and expediently. Thanks for the superb service – they went the extra mile! I’m very appreciative as always. The shutters look great! Thanks for the follow through. Please thank the workers as well for a nice job. I appreciate it as does the house. Just a short note to congratulate you on another job well done! The house came out great, and that was certainly a product of your concern for getting it all done right. Please pass on our appreciation to the guys and our thanks too. Thanks! I appreciate the kindness of the workers and the time they took to explain the problem and ways to avoid it again. Wanted to let you know that our project was completed today and we have to say “well done!”. Thank you. Just want you to know that the guys who have been working here are excellent. Very hard workers and very polite. The main purpose of this letter is to express our thanks to the installation crew. They appeared on time, performed the work in a professional manner, they were courteous and did a great clean up job. You are fortunate to have such dedicated people working for your company. Again, we express our thanks for a job well done and wish you continued success.